I rather enjoy the challenge of making cards nowadays. It took me a long time to feel comfortable creating a card, but it isn’t nearly as scary as it once was. I’ve learned to keep my designs simple, use my scrap papers and stick with simple embellishments. This first card is a design I use often. It’s great for using two pattern papers that coordinate and the pieces can be moved around, put at angles, left uneven and the design also works horizontally or vertically. 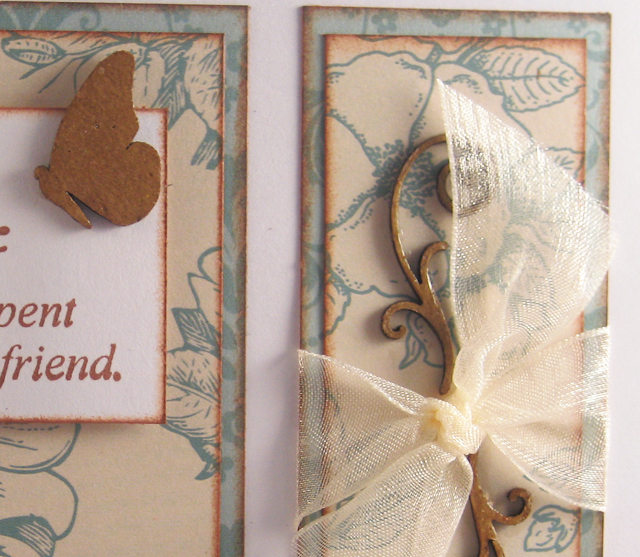 The embellishments used here are by Globecraft & Piccolo, known as G&P. They’re a local company out of Midland, Michigan and I like their products. I’m on their design team, but I was using their products long before that ever happened. What I like about the bookboard accents for card making is that they are pretty thin. If they’re adhered directly to the page and not lifted, they will go through the mail at a normal rate. For the card above I removed the pieces from their backing and coated them with Glastique Gloss Finishing Glaze. This product leaves a nice shiny finish on the piece and acts as a sealer. These pieces are from the Birds & Butterflies Accents. There are enough pieces in this collection to easily stretch over two to three cards. The Glastique is applied directly to the bookboard piece from the bottle with the fine tip and left to dry for a bit. I also used the Glastique as an adhesive to attach the bookboard pieces to the card. The next card uses the G&P Girl’s Night Out Embossing Powder applied with the G&P Embossing Powder Adhesive with a dabber top. The dabber top on the embossing powder adhesive really helps it to apply easily and with good coverage. We always recommend rolling our jars of embossing powder to blend the granules rather than shaking which could cause the larger granules to sink to the bottom of the jar. The heart on this card has three coats of powder on it; each applied after the previous coat is cool to the touch and then heat set again till smooth. The variegation of colors in the powders gives the embossed pieces a great dimensional look. 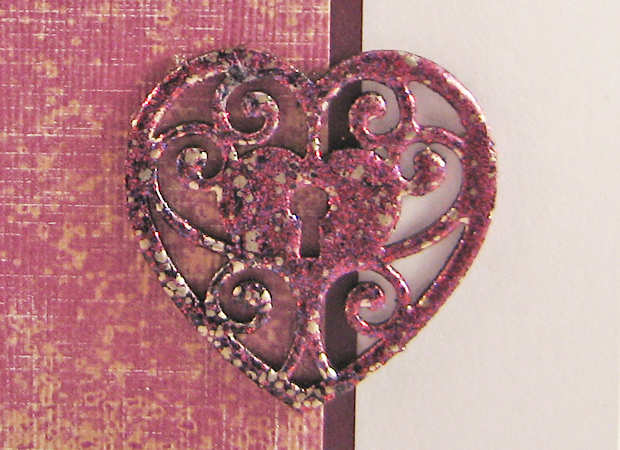 The key is embossed with two coats of G&P Vintage Silver Embossing Powder in the same manner as the heart. Each piece is adhered to the card with Glastique. 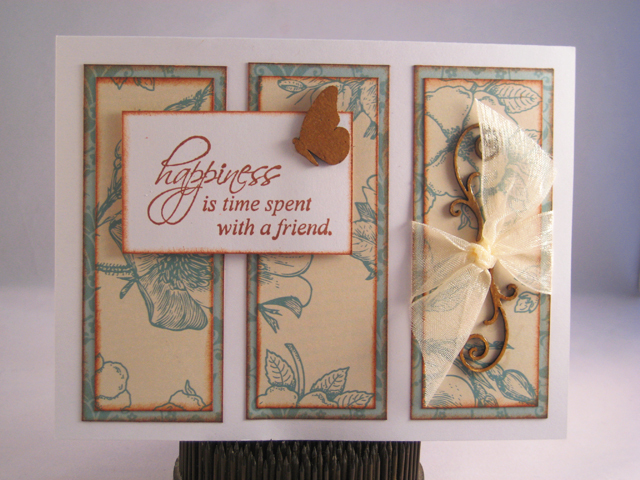 The embossing powders help to create a faux metal look which blends well with the paper selection. 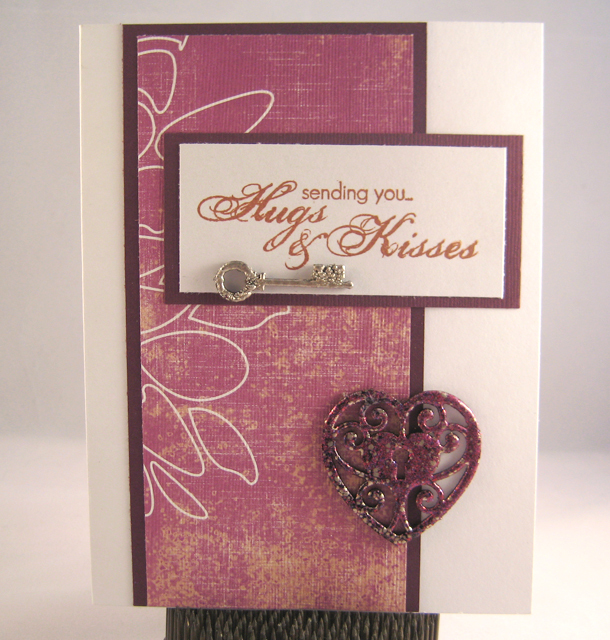 Cardmaking is a fun activity that anyone can learn. It doesn’t have to be difficult and over-the-top. Keep your cards basic and simple and easy to mail. It’s the sentiment that you write on the inside that touches people’s heart and the just the thought alone that you cared enough to send a hand-made card. Beautiful cards, Linda. Love your treatment of the heart and flourish. They are both beautiful. Love the colours on the first one. Great cards, Linda! I love the gloss you achieved with the Glastique. Gonna have to check that out. You shouldn’t be nervous about making cards…the finished product is gorgeous!